The annual Design Festival was launched by the Estonian Association of Designers five years ago. The reason was simple – to make Estonian design visible and help the general audience to understand the nature of design. This is why the festival programme normally includes educative seminars, lectures and workshops besides the traditional exhibitions and fashion shows. The organisers wish to demonstrate how it is possible to apply creativity and design more efficiently while creating a better physical and social environment. The key word of the festival is synthesis – implying on an ever-progressive process where the different areas of culture merge into something not so easily definable. The event that was initially planned to last only for a night is turning into a full-day festival that raises a different issue and a message addressed to the general public each year. Our festival honours creativity and designers who are the creators of our cultural heritage; it is concerned about the global environmental problems and the green way of thinking; it respects innovative achievements, etc. 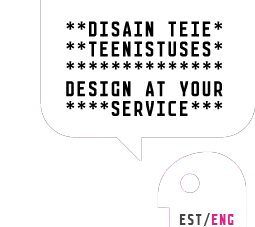 This year, our events are organised under the motto Design at Your Service. The 5th Design Night Festival will be held in Tallinn from 23 to 26 September. The hottest spot of the festival will be in a place that should be well known to all creative persons in town –the Rotermanni block. The festival will be kicked off by a seminar Cities For All – Tallinn For All that will address everyone and use examples from around the world to illustrate how the living environment can be improved by way of Design For All principles. A presentation of Francesc Aragall, concentrating on Barcelona, will provide evidence to the effect that improved access to a city and enhanced information systems can have on the turnover of the tourism sector; Julia Cassim, a design expert of the Royal College of Art will provide illustrative examples of how to improve the user friendliness of the services and products of various cities; Pete Kercher, Finn Petren and Avril Accolla will share their long-term experience. Experts from five countries will organise a workshop together with local designers, people with special needs and other interested persons to find out how the universal design solutions found in the city match the expectations of their target groups (mothers with children, handicapped persons in wheelchairs, tourists with wheeled suitcases, people with visual impairments, etc). There will also be a mapping of the actual needs and possibilities for making changes, designing of new products/services, and improving of the accessibility and visitation possibilities of the city. International teams will analyse the situation and engage in finding new solutions. The results of the competition with specific design solutions (plans, prototypes, scenarios, reports and illustrative materials) will be exhibited at the European Innovation Festival and the Design Night; the works will also be introduced at the next year’s Estonian Culture Festival in Paris. Another topic that will be covered at the conference is design management as a tool that ensures added value in the process of creating strong imagery. This discipline has gained wide acceptance in Estonia and The Pärnu College of the University of Tartu has started to teach this subject. By the end of the conference that will be organised in cooperation with the LoovEesti association it should be identified whether some companies are more successful than others and does the success have anything to do with design. Several acknowledged speakers will perform: Jean Schneider (France), Kathryn Best (England); Marco Steinberg (Finland). The best users of design in Estonia will also have something to say. The workshops will encourage designers to once again do some work with their bare hands. Prof. Gregor Krisztian (Germany) and Björn Koop will demonstrate the work of true masters and show how thoughts can be visualised. The tradition to find connections in the area of design will continue. A workshop with the name of Leib (‘Bread’ in Estonian) will research the high value of Estonian pastry. We will also look for something called Eesti eine (Estonian meal). Material specialist Simone de Waart (Material Sense - Holland) will organise a workshop to whoever is seeking new ideas in food packaging and branding and is interested in coming up with ideas for an Estonian meal. Professional food specialists will be involved in the workshop. The apex of the festival will be the moment of handing over the Estonian design prize Bruno. BRUNO, the Estonian design prize, will be given out for the third time. The prize was named after Professor Bruno Tomberg, the founder of the design department, whose initiative led to design prizes being given out by the department also in the 1920s. An international jury will have to choose the winner from among 74 works that have been sent in to participate. Prizes are given out in three categories: the best Estonian product design, the best design project, and excellent design management. On 24 September an exhibition of the nominees will be opened in the Gallery of Architecture and Design. Prizes will be handed over at a gala event at the same night in the Rotermanni block. For the first time the audience will have a chance to see the Estonian design world from the inside on the big screen, as Estonian film “Estonian design from the inside” will premiere. Ene Läkk will give an astonishing overview of how Estonian design was caught on camera. A theatrical performance in Sõprus cinema will cover the topic of finding identity. One can be positively surprised by a Design Auction. The auction will be led by Mart Sander who has proven to be a highly artistic person. The audience can witness the making of pieces specially created for the auction by Estonian and foreign authors. In order to prove that Estonian creative persons are not just a bunch of inwards bending introverts, participants can take part in a contact event Pecha Kucha by delivering presentations with up to 20 slides (20 seconds for each). In previous years, this event has brought several positive surprises to the audience. The old elevator building of the Rotermanni block will be decorated with newer Estonian design by an exhibition called ‘100 metres to design’. A block of tents will be erected in the central section of the estate; the environment will be shaped by landscapers and a social project DEMO_polis from Portugal. The festival will feature design-aware exhibitions Out of the Box, Bike and Dutch Bike Fantasy from Holland. Creative energy will flourish in fashion shows and new collections of Estonian fashion designers. The weekend fashion show will be held under the motto ‘Fashion Design at Your Service’. Reet Aus will present her new collection Out of Fashion for the fifth time at the Design Night. Tõnis Mägi, Kärt Johansson and others will perform. A competition for finding the best ‘representative pillow’ will be held in cooperation with a hotel. The festival will be organised by hardworking Estonian designers. The festival will get support from the Cultural Endowment, the Cultural Heritage Department and other partners.